Wise Owl’s food state supplements are, quite simply, food without the bulk. Our vitamins and minerals are truly natural supplements, made using high quality ingredients, in a whole food matrix. They can provide your body with the levels of nutrients our ancestors consumed, as nature intended. Wise Owl Heath have put this Digestive Duo of Probiotic & Caprylic Acid together to help you restore your natural balance of gut ‘micro’ flora, for a healthy, happy gut. 10% off individually purchased prices. A healthy gut needs a positive balance of good bacteria. The digestive system can be easily upset due to a unhealthy diet, stress, antibiotics & travel. Under these conditions candida fungus can quickly overrun the good bacteria. Beneficial bacteria in the intestines help digest foods, create vitamins & inhibit the growth of disease-promoting (pathogenic) bacteria. 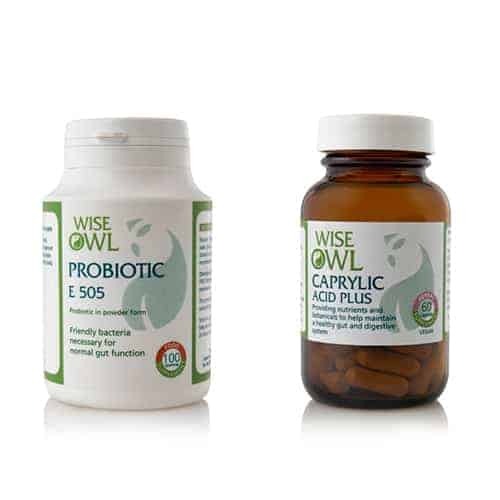 Wise Owl's Probiotic consists of 8 friendly bacteria which are necessary for the normal functioning of the gut, along with a beneficial prebiotic. In powder form, our probiotic is re-hydrated in a glass of water, bringing the good bacteria back to their most active state, unlike swallowing a capule which would re-hydrate them in stomach acid. Caprylic Acid is a type of beneficial fatty acid that has antibacterial, antiviral, anti-fungal & anti-inflammatory properties & acts as a natural yeast-fighting agent. This is a uniquely formulated complex, containing eleven beneficial substances which may help restore your natural balance of native live bacteria for a healthy gastro-intestinal tract. Unlike 90% of our supplements, our probiotics are not whole food as such, but food extracts selected for their excellent results with consumers. Recommended Intake: Dissolve 1 teaspoon (3g) of the probiotic in lukewarm water, leave for approx. 1min, drink on an empty stomach or before sleeping. Do not exceed the recommended dose. Unlike 90% of our supplements, our caprylic acid is not whole food as such, but food extracts selected for their excellent results with consumers. Suggested Intake: 2 capsules daily (taken am and lunchtime, half an hour before eating) or take as directed by a practitioner. Suitable for: Men, women and the elderly including vegetarians and vegans, and for people with Candida and yeast sensitivities. Contraindications: Pregnant or breastfeeding women should not take this product unless advised to do so by a Doctor. Not suitable for people with ulcerative colitis or inflammatory bowel disease. 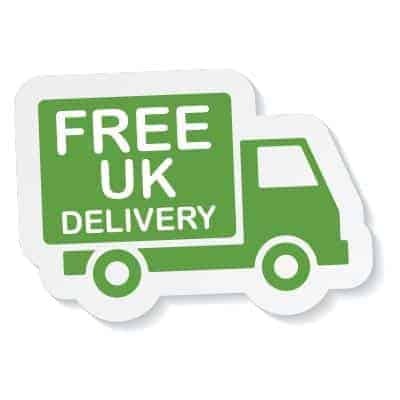 Free From: live yeast, wheat, gluten, soy, starch, lactose, added sugars, colouring, flavouring & preservatives. Allergy Concerns: No known allergic reactions to ingredients in this formula, but some people can be sensitive to coconut derivatives, although this has not been encountered with this product to date. Product Ingredients: Maize starch, maltodextrin, maize dextrin, inulin, potassium chloride, magnesium sulphate, bacterial strains*, fructo-oligosaccharides (FOS), enzymes (amylases), vegetable protein, vanilla powder and manganese sulphate. Products Ingredients: Caprylic acid from calcium caprylate, slippery elm inner bark, garlic, aloe vera, pau d’arco, glutamine, cinnamon, lemon grass, grapefruit seed, peppermint, coenzyme Q10, capsule shell: vegetable cellulose. This information is not intended to replace orthodox medical treatment, but is offered as additional, complementary information. Food supplements must not be used as a substitute for a varied, nutritional and balanced diet. If you are pregnant, breastfeeding, taking any medication or are currently undergoing medical advice, please consult a doctor or healthcare professional before use. Refrain from taking the food supplements if adverse reactions occur and consult a doctor. Do not use if the goods are received without a tamper strip securely in place. The human body is a walking ecosystem. Although we do not usually think of ourselves in this way, the fact is that we are each ‘home’ to 100,000,000,000,000 (=1014) micro-organisms, which is more than there are people in the world! Although some of these micro-organisms inside us may be harmful, the vast majority are not. In fact, they are necessary for good health. For instance, beneficial bacteria in the intestines help digest foods, create vitamins and inhibit the growth of disease-promoting (pathogenic) bacteria. Without these beneficial (or probiotic) bacteria we could not survive. What exactly is a probiotic? The definition of a probiotic is a live microbial supplement that beneficially affects the host by improving its intestinal microbial balance. A normal, healthy gut flora is in balance. This balance can be disturbed, e.g. by a food infection or after the use of antibiotics. Probiotics consist of bacteria; the same beneficial bacteria that are found in a healthy intestine. These bacteria may help to restore or rebuild the microbial balance in the human gut. Our present knowledge of the gut ecosystem suggests four ways in which ‘good bacteria’ may be operating. Firstly, by the production of anti-microbial substances; i.e. creating an environment in which the harmful bacteria are not able to survive. Other ways to compete with the harmful bacteria is either by competition for nutrients, or by competition for a place to adhere in the intestine. As long as the intestine is covered by the beneficial, probiotic bacteria, it will be very difficult for the pathogenic bacteria to colonise in there. Finally, it is also becoming increasingly evident that the probiotic bacteria can positively influence the functioning of the immune system. To achieve this, it is vitally important that the recommended dosage of bacteria (2 – 3 gram/day) reach the intestines alive and active. Wise Owl has selected a probiotic combination containing a mineral mix which enhances the growth and survival rates of the bacteria in the most effective way. In its powder form, un-refridgerated it can maintain a good shelf life. The directions for use require the addition of warm water and a ten minute infusion period to allow full biological activity when introduced to an empty stomach. Wise Owl Probiotic contains, besides the living micro organisms and mineral mix, corn starch, FOS (fructo-oligosaccharides) and enzymes. In combination, these components represent a matrix which guarantees both stability and biological activity of the product. A great deal of research has been undertaken in regards to the optimal composition of such a matrix and has consequently learned that the present formulation, of this matrix, provides a stable base as well as sufficient nutrients for the bacteria. This results in a product with a proven high CFU (Colony Forming Unit) count which, after deposited in water, provides significant biological activity. Wise Owl Probiotic is provided as a loose powder in a sachet rather than a capsule. This is the only way to provide sufficient nutrients to the bacteria to reactivate them before digestion. We recommend rehydrating the bacteria in a glass of water before consumption to help them be properly active when they are ingested. We do this because during the careful manufacturing process, the bacteria are dehydrated at their most active growth phase. Rehydrating with water helps them start where they left off. Direct consumption of a capsule into the acidic environment of the stomach would supply the bacteria with acid rather than the water they were originally deprived off. As can be seen, this would not be conducive to growth of the cells. A great deal of research has already been carried out on our probiotic bacteria with more planned for this year. This research has shown clear immune supporting effects and an improved activity of the bacteria in the gut when taken in the logical manner we suggest. Candida (yeast) overgrowth has unfortunately become a common problem. This has been created by the excess use of antibiotics, high sugar & alcohol intake, cortisone, & birth control pill usage, low stomach acidity, the heavy use of stomach acid blocking agents, & the presence of immune system disorders. The candida overgrowth is in the mucous membranes, most commonly the gastrointestinal system & genitalia, but any mucous membrane can be involved. Caprylic acid is commonly used to inhibit the growth of fungi, especially the yeast-like fungus Candida albicans, the organism responsible for candidiasis (‘yeast infection’). Many apparently healthy men and women have some Candida in their gastrointestinal tract, but it is usually kept in check by Lactobacillus bacteria. When this check fails, the result can be acid stomach, abdominal pain, indigestion, constipation, diarrhea, itching, or symptoms of intoxication. Caprylic acid is a fatty acid derived from coconut oil & has been found to exhibit antifungal properties on contact with the fungus. It specifically is effective for gastrointestinal candida overgrowth. Once absorbed, caprylic acid is no longer antifungal but is then metabolized to produce energy. Garlic is a powerful antifungal and immune stimulant. Garlic will also help with constipation, gas, excess mucous, and blood cleansing; it is antiparasitic and hypotensive also. Grapefruit Seed extract combats infections from: Parasites (single and multi-celled), Bacterial, Viral and Fungal. Candida Yeast Infections, Thrush and Chronic Fatigue. I have been using the probiotic for a couple of months and it is very good. My digestion has improved considerably. I have now started to take the caprylic acid tablets as well. Two very good products.